Review Paper for the semester. With time table for US draw down in Afghanistan approaching very fast and lack of a responsible regional power in the forefront apart from India, to manage post US pull out situation, it is important to ascertain Indian interests in Afghanistan in general and Af-Pak region in particular i.e., especially lawless lands of the porous borders of where a significant chunk of land mass of the either side of Durrand line is not in control of neither Afghanistan nor Pakistan. While in a way Pakistan may be a willing partner so far as providing safe havens for Good Terrorists it may not be the case with Afghanistan. There are two views about the role of India in Afghanistan, narrower and broader. While the former purportedly suggests that India is up for a zero sum game in Afghanistan vis-à-vis Pakistan and also it wants to engage Pakistan in another theater, then ultimately try to undo the idea of Pakistan etc., While narratives such as these help the deep state in Pakistan i.e., the security establishment remains relevant with such views and retains the primacy over all other democratic institutions and continues to consume large amount of resources which should otherwise be spent on the welfare activities of ordinary citizenry. The reach of such narrative is only with in the territorial borders of Pakistan, as there are hardly any takers who would buy such a trope outside Pakistan. On a broader note India is seen as force of stability. Political stability is a pre-cursor for growth, economic or otherwise. India is seen as a country that has no expansionist goals and believes in peaceful co-existence with in the comity of nations, hence it is only natural to expect USA to hand over the affairs of Afghanistan to India and recognize it as a responsible regional power if not an emerging global power. India’s credibility has been well established by its developmental assistance, i.e., primarily its US$ 2 billion which it offered to Afghanistan. In a 2010 survey by ABC poll in Afghanistan, more than 74% of Afghanis hold a favorable opinion on India, only 9% for Pakistan and less than 20% on USA. But there is another view on why India wants to take charge of the situation in Afghanistan, beyond the alleged Anti-Pak agenda. India does not want to see this important territory again become safe havens for Global Jihadists whose goals are transnational rather than a specific region. In its decade long protracted Global War on Terror that has cost USA enormous amount of economic capital, it is still not in a position to declare its comprehensive victory, killing Bin Laden alone does not constitute victory. With that situation India worries that Afghanistan could once again become a breeding ground for terrorists whose focus is on India in general and Kashmir in particular with active support of Pakistani state is a real possibility, Pakistani behaviour is well documented in this regard. India must in all its capability should work and indeed is working towards avoiding such a situation. On the face of it, this might appear as an Indian Interest but on a larger scale it is also the interest of International Community. After all international peace is the stated goal of all responsible states. The problem arises when Pakistan wants to turn Afghanistan in to another theatre for its Anti-India operations which is borne out of its paranoia on India and the perpetual inferiority complex it thrives on. Though it is a globally known fact that nobody wants to intervene directly including super powers primarily to respect Indian position that India-Pakistan issues are for the bi-lateral discussion not for others to intervene. A second relevant Indian interest is a access to central Asia; a friendly Afghanistan would ensure just that. This will open up the possibilities of greater economic ties with central Asian states. The alternative route is only Iran, which is not only complicated & conditioned with bilateral ties between India-US & India-Iran, further it depends on the results of negotiations between powers headed by US and Iran on the issue of Iran’s nuclear program. It is a great tragedy that India because of its disastrous handling of Jammu & Kashmir Princely state has lost a key tract of land to Pakistani aggression right after the independence , i.e., one third of land which Pakistan has occupied and is called Pakistan occupied Kashmir. It is due to this India has lost shortest land route to central Asia, i.e., the shortest to central Asia through Afghanistan. 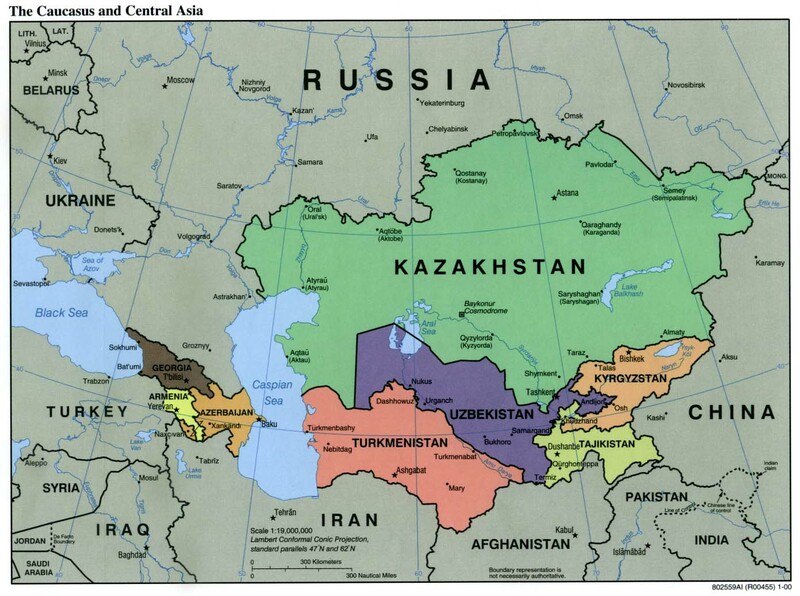 Image Courtesy: http://en.wikipedia.org/wiki/Geostrategy_in_Central_Asia, accessed on 19th January 6 PM IST. Cultural affinity of India & Afghanistan is a great link for people to people connectivity, Indian TV serials and Bollywood have a great appeal among the Afghanis. Indian council of cultural relations has been doing a great work in this line i.e., providing scholarships for Afghanistan students in India etc., With such deepening people to people ties, citizens of each country could demand accountability from their elected leaders which is a good sign for any fledgling democracy. With a greater say in Afghanistan on a positive note India could benefit on economic plane too, i.e., possible access to Afghanistan’s natural resources which are yet to be explored/realized. The strategic partnership agreement signed between India and Afghanistan is a paradigm shift in the post 9/11 world and is comprehensive in nature. Aspects like resisting Pakistani influence, greater economic co-operation, security and other interests might sound like Indian interests, but a closer review would confirm that they are global interests too. This entry was posted in Afghanistan, Afpak, Pakistan, South Asia, Terrorism and tagged Afghanistan, India, Pakistan, South Asia, Terrorism. Bookmark the permalink. Reblogged this on Hadiya Shah.